Sister Mary Ann Rawson was born in Tonasket, Washington, and raised in Okanogan. The oldest child of Helen Wells Rawson and Robert Grindal Rawson, she was big sister to brothers Timothy, Richard, John, and Henry, and two cousins, Ronald and Quentin Wells, who her parents raised. Mary Ann attended Christ the King Grade School, Omak, and Okanogan High School. Her parents had a rule that their children would attend a Catholic college for at least one year. Mary Ann chose Holy Names College, Spokane, graduating in 1963 with a bachelor of music education. She then entered the Holy Names Sisters and after the novitiate was assigned to Holy Names Academy, Seattle. Other teaching assignments in Washington State included St. Aloysius, Spokane; Holy Rosary, Pomeroy; and Christ the King, Richland. She taught piano and music education in the school and did pastoral work directing choirs and training ministers and cantors. She was active in the Tri-City Music Educators Association serving as its president and completed a master’s in music education at Western Washington University. 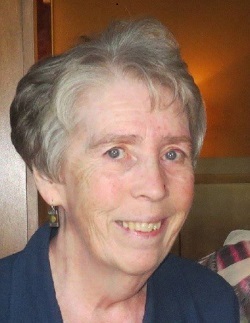 Mary Ann then changed direction and took a year of CPE (Clinical Pastoral Education) at St. John’s Hospital, Lowell, Massachusetts, later becoming Pastoral Associate at St. Stanislaus Parish, Lewiston, Idaho. A warmer climate beckoned Mary Ann, so she worked a year at Yuma Regional Medical Center taking another CPE course. She then took a position in chaplaincy at Carondelet St. Mary’s, St. Joseph’s and Holy Family Center, Tucson. She has been in Tucson ever since where she remains active in parish choirs, in chaplaincy, as treasurer of the local Chaplains Association, and as a CASA (Court Appointed Special Advocate). The years have passed quickly and Mary Ann is so grateful for the Sisters she lived with, for the faculties she worked with and the students she taught who have done so well in passing on the faith to their children, and for the many gifts that she has been privileged to witness in each person. She is also very grateful to her family who has supported her through the years. She is truly blessed in seeing her gifts and being allowed to follow God’s call for her.